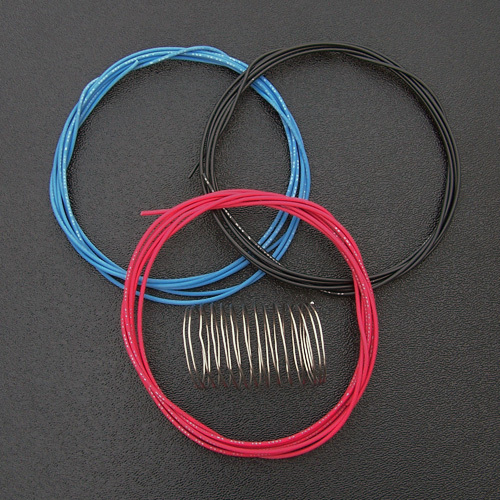 22 gauge hookup wire and solder for guitar electronics wiring. Wire style: UL1007 / 1569, pre-tinned 22 AWG copper wire, 7 strands (7 x 30), 300v, PVC insulation (0.016"), 0.062" outer diameter. This is the same wire we use for all our complete Strat pickguard assemblies. Includes a total of 15 feet of wire, 5 feet of each of the 3 color wire. Also included is 5 feet of Kester #275 0.031" diameter rosin core solder, Sn63/Pb37.